Vincent Naylor has just been released from prison and has already begun to plot his next heist—the robbery of an armored car. Detective Sergeant Bob Tidey has been caught perjuring himself to protect fellow officers. He's also found the link between an unsolved murder case and the recent execution of a corrupt banker in serious financial difficulty. An old acquaintance will change the course of the investigation. A retired nun living on regrets and bad memories notices something deeply suspicious and makes a phone call that sets in motion a series of fateful events. 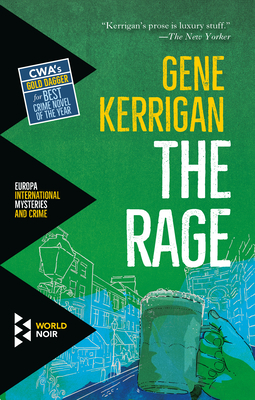 In The Rage, Gene Kerrigan weaves together astute observations regarding a financial crisis, church abuse, and gangland crime. The writing is, as always with a Kerrigan novel, superb, with an engaging story that has pitch perfect dialogue and characters that come fully alive. The prize-winning crime fiction is set in contemporary Ireland where nothing is neatly resolved and there are no easy choices. Like life itself. Gene Kerrigan is a Dublin writer. He has been a journalist for over thirty years, Journalist of the Year in 1985 and 1990, and is the author of Another Country, This Great Little Nation (with Pat Brennan), Never Make a Promise You Can't Break: How to Succeed in Irish Politics, and the novel, Little Criminals. "Kerrigan's clean, spare style adapts smoothly to the striving characters who lend their many voices to this narrative. What's more striking, though, is the similarity of their aspirations and the familiarity of their discontents." "Tightly plotted...the story's pacing is masterly." "Fans [of The Wire] can find many of the same strengths in Kerrigan's work." "A boundlessly readable portrait of an Ireland in which all the old certainties have vanished. Remarkable for its verve, moral trickiness, and nifty plotting." "For authenticity, narrative, plot, writing skill, the gritty noirish crime milieu setting, and the post-Celtic-Tiger-Ireland toxicity, Kerrigan's latest well deserves its CWA Gold Dagger Award." "With a dexterous use of language married to masterful plotting, Kerrigan has something of James Joyce's ability in conjuring up a vivid Dublin--but this modern city is very different than the one Leopold Bloom wandered through."